Okay, so decorating my son's room is something I still haven't got around to. It's still the room I am most unsure of. I want cutesy childlike furniture but I want it to last until he's much older. 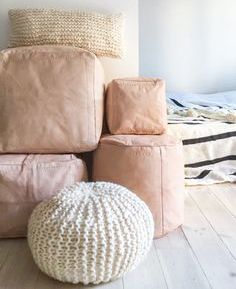 Saying that, I was browsing through Pinterest and came across DIY Pouffes. Now, I love pouffe's. They can make any room look cozy just by laying on the floor. Because of that, I've decided, I'm going to make a Pouffe for his room! I just love making and the best part is, you can pretty much make it look how you want, I mean talking in terms of colour choices, fabrics and textures. Another DIY for you guys?! 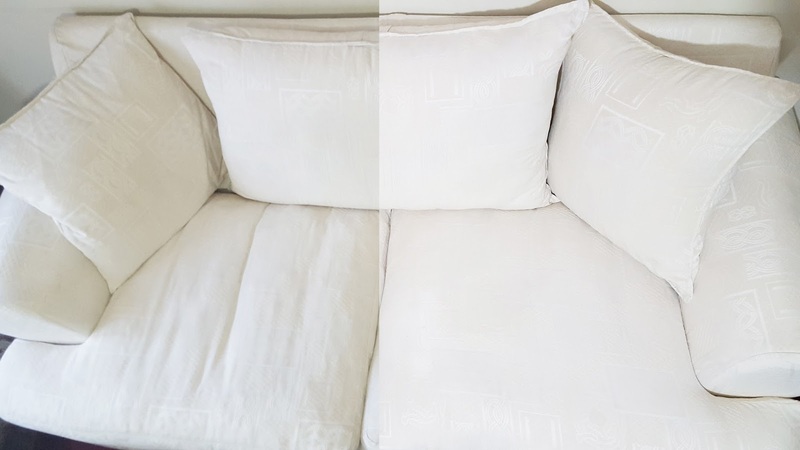 How To Make Your Old Sofa Look New Again! Okay, so for the past week or so, I've been working on making this sofa look brand new again. I've been meaning to do this for a while now and finally I have the chance. But how I was going to do it had me quite unsure. 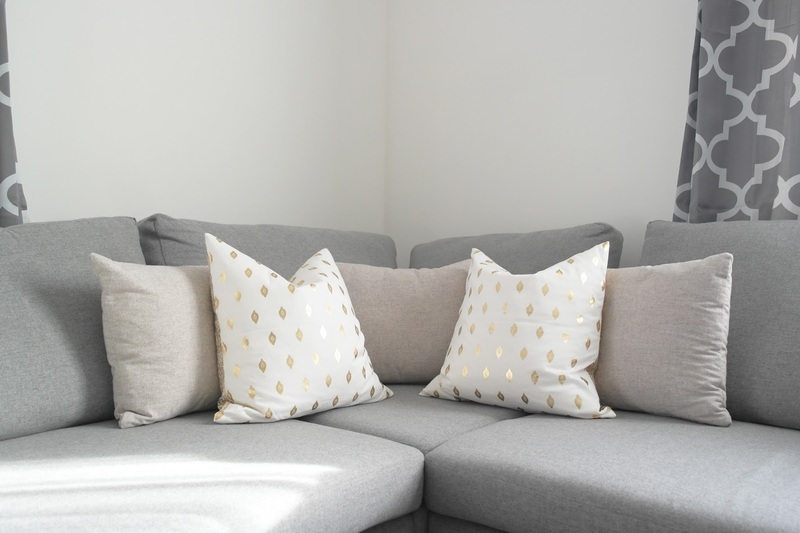 So whilst searching online to find the easiest and most cost effective ways to get it done, I came across Apartment Therapy's Sofa Solutions on How to Plump up an Old, Saggy Sofa for Under $30 and thought that's it! I read her post and it's such a simple and cheap way to do it. I used her method of using Poly-fil to fill the sofa's up. Read along and I'll show you 5 simple steps I took to plump it up. When decorating a room sometimes I want furniture to blend in, and at times I want furniture to stand out. Well this is probably one of those item's I prefer to blend in. I know I have this obsession with matching and by now you all must think I am some crazy OCD matching freak. To be honest the more I write these blog-posts, the more I'm starting to believe it myself. Well, I have this thing with everything in a room having to match in one way or another. 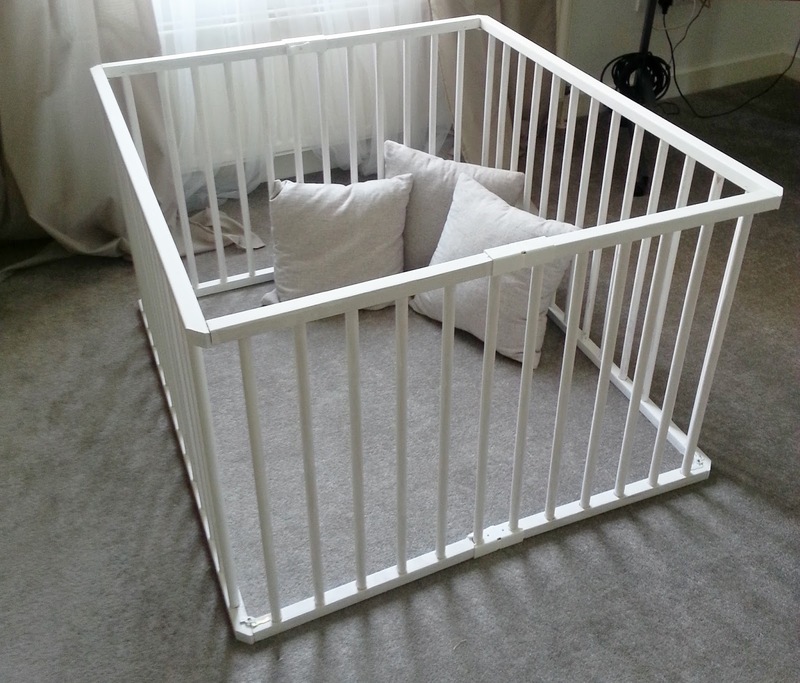 So here goes, I transformed my son's play pen white because I felt it would work in our living room more. When I got his play pen it was a brown colour. The colour was nice, I just didn't believe it looked nice with the rest of the room. 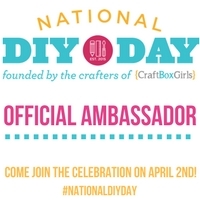 The only thing I could do was DIY! Step 1: Flowers. Flowers just have a way of making a room look so cosy and very beautiful. 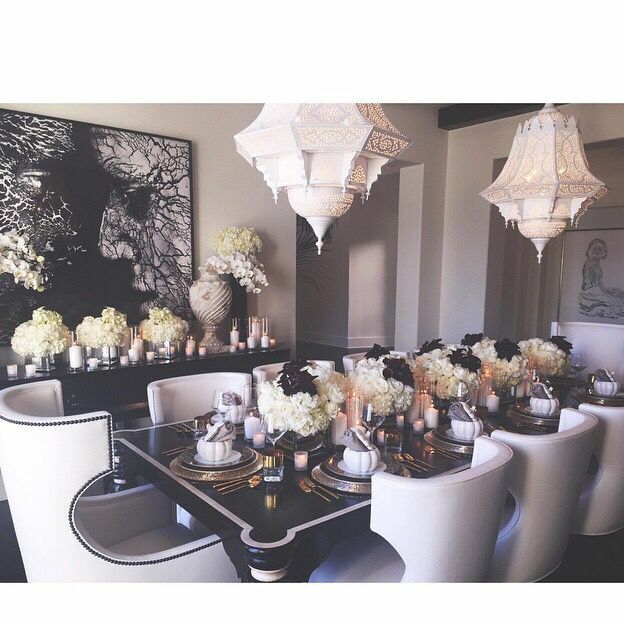 The picture above is of Khloe Kardashian's dining room. She has got it spot on with her flowers. This look was for Thanksgiving dinner with her family. So beautiful how the flowers have been set down the middle of the table. The colours of the flowers match both the table and the chairs. Fresh aren't always that cost friendly, so there is that option of buying fake ones and bringing them out every time you have a dinner party. Saves money in the long run. I know sometimes dressing up your home can be quite expensive. 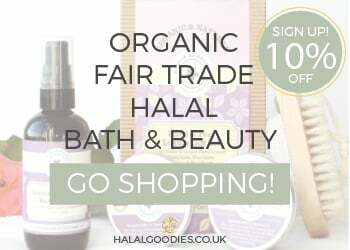 You may think that it'll break the bank but it doesn't have to. You can make it look more luxurious by simply buying glamorous looking accessories. 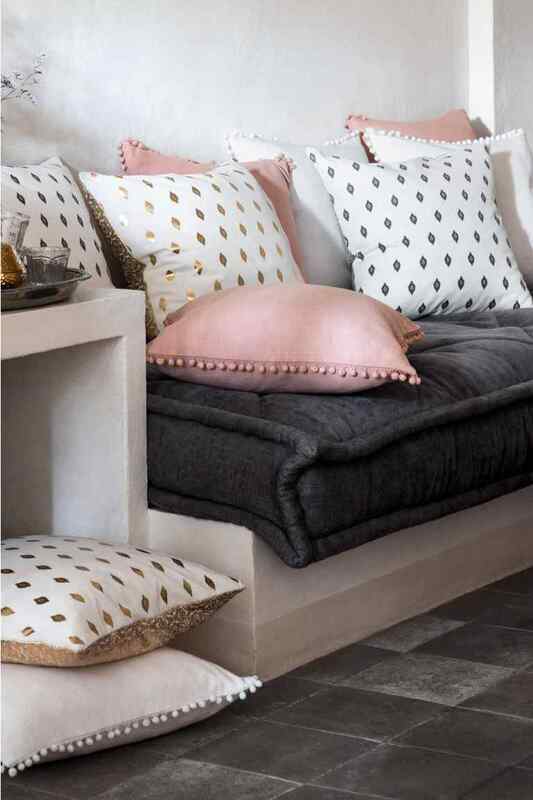 A few cushions can really upscale the look of your living room. I've just bought these new cushions from H&M and I'm kind of in love. It's exactly what I have been looking for. I find nice gold cushions are quite hard to come across so when I saw H&M sold these, I just had to get it. Gold and white, lovely prints, just beautiful! I find gold has a thing with making rooms look more elegant. When, decorating a house it is a must to have one or two amazing pieces of wall art right? But there's just so many so where do I start? That my friend is a good question. I've looked around at a few different types of wall art and ended up not getting very far with which type to go for. To be honest, I'm sure as most of you have guessed by now, I'm quite particular. I want something that will be simple but have meaning also. As a result of that, I've ended up making my own! My creative instincts were just buzzing at the thought of being able to do it myself. So here are a few that I have made. The striped ones are inspired by a picture I found in Megan Hess's Instagram. Obviously they're not framed yet, but when I get to that, I will make a post of the finished product and how it looks inside my apartment. Hey guys, so I don't usually do this, but there is a huge crisis in Calais and we need your help! Please donate just £5 HERE. It will provide them with a big bag with 2 weeks worth of food, toilet roll, aspirin plastic cutlery, foil blankets and more costs £25.150 of these costs £3750.It's also going to cost £400 to get five cars out there and back. 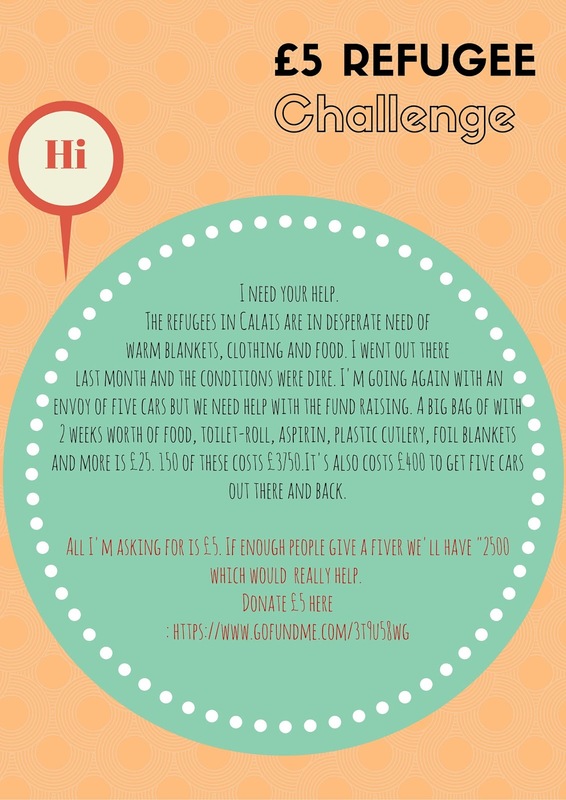 £5 means a lot more to these poor people than to you or me.. if you could just find the kindness to give a fiver it would really really help these vulnerable innocent people that just do not have adequate food or shelter. Children's room inspiration, I've seen so many different styles and it's somehow become mind boggling trying to decide what to go for in my son's room. Decorating his room has probably been the toughest for me so far because I'm just so unsure of what kind of decor to go for. I kind of want something that is quite childlike but will work until he's a little older. Too childish isn't really much of an option. Of all of the room's I've seen though, by far, these room's are definitely the best and a source of inspiration for decorating my son's room: Jessica Alba's kid's rooms. 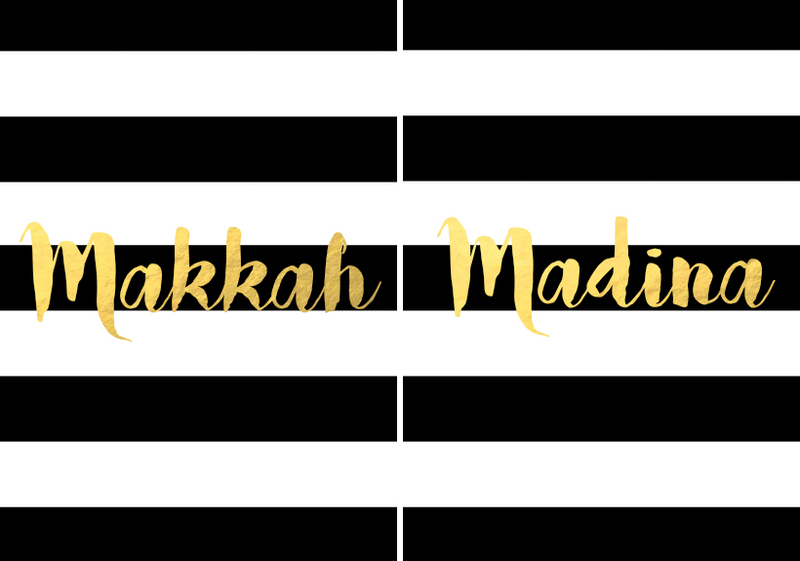 Hey there, so another addition to our Barakah collection is Setta. This means six in Arabic. It's an open front farasha abaya with a silk, butter pink bias binding. The binding comes down the front and across the ties. The ties are there to give that fitted look. but it's still kept modest as they go inside the abaya at the back. This gives it that fitted but not tight look, especially on the hips at the back. Now, a new year has begun and for me that means accessorizing the home for that fresh new year feel. There are a whole bunch of things I want to buy for my home. Here are just a few things that are on my wishlist.